Beirut, November 9, 2018 - For one of Kenya’s best-known politicians, it’s time to get back on track. In recent years Wesley Korir has been many things to many people–a member of Kenyan Parliament, Boston Marathon champion, a philanthropist with various charity projects–but the 35-year-old is first and foremost a runner, and now he’s ready to return to his first love. After a nightmare experience at the Rio Olympics in 2016, Korir found his beloved sport taking a back seat in life as his political career in Kenya soaked up so much of his time. It got to the point where not only his running suffered, but also Korir’s ability to spend time with his family. His wife, Tarah, gave birth to their fourth child earlier this summer, and that was the catalyst to convince him it was time to bench his political career, at least for now. “I took a break to concentrate on my family, to spend more time with them and also to get back to running,” he says. That decision is also why, one week shy of his 36th birthday, Korir now finds himself in a place he’s never been: Beirut, Lebanon. 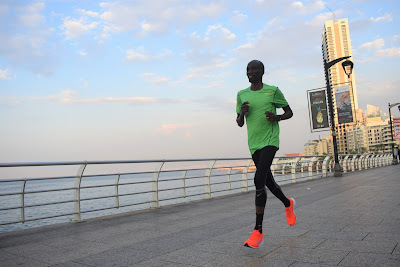 On Sunday morning, he will tackle 26.2 miles for the first time since April 2017, lining up against an international field to chase a first prize of US $15,000 at the BLOM Bank Beirut Marathon. 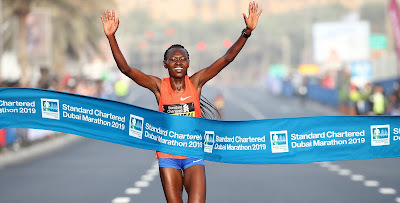 As a father of four, there are certainly more demands on Korir’s time these days than in 2012 when he rose to the top of the marathon world, taking victory in Boston in 2:12:40 before lowering his PB to 2:06:13 later that year in Chicago. Coached remotely by Ron Mann, his former college coach at the University of Louisville, Korir still finds time to log between 80 and 100 miles a week. If that sounds conservative for a world-class marathoner, it should be noted it’s by design, with Korir unable to race so far in 2018 after withdrawing from the Ottawa Marathon in May due to shin splints. “My injuries are gone now so I was able to get back into a lot of mileage and get a very good build-up,” he said on Thursday afternoon, limbering up for Sunday’s race with a gentle jog alongside Beirut’s waterfront. While his competitive fire still burns, these days his mission is less about him and more about his countrymen. When Korir is not spending time with his family he’s kept busy with charity projects, primarily the Kenyan Kids Foundation, and he feels his time in politics has given him the perfect grounding for such work. “It’s about empowerment through dairy farming,” he said. “Most of the people in rural Kenya are farming so we’re trying to help them, starting co-operative societies where we put farmers together and have them sell at a better price. There’s also the Transcend Running Academy, which Korir set up to give standout young runners in Kenya a helping hand to reach their full potential. While there have been many highs in his running career, an undoubted low came his way in 2016, with Korir forced to drop out of the Olympic Marathon in Rio after vomiting several times on the course, which he now reveals was down to a mix-up at the drinks station. At his base in Eldoret, Korir trained alongside younger brother John Kipkosgei Korir, who clocked 2:09:14 to finish runner-up at the Ottawa Marathon this year, and now, as he finally gets back on the start line, Wesley figures a similar result could be on the cards in Beirut. About the BLOM Bank Beirut Marathon: the race was first held in 2003, attracting over 6,000 runners from 49 countries, and has since grown into one of the world’s biggest marathons, with 48,000 runners toeing the line last year and a record-breaking 50,000 expected this year. Created by businesswoman May El-Khalil, the race has the theme of unity at its core and brings together both competitive and recreational athletes from various backgrounds in a friendly festival of participation and inclusion. Invite me to run Beirut next year I like that race. Do Kenyan athletes need physiotherapists?